Cryo Spa Natural Healing Center is a Health and Wellness center in Southampton PA that assists people with natural healing methods to positively impact health. Our specialties include diverse alternative modalities such as Shiatsu (or Acupressure), Specialty Massages, Whole Body Cryotherapy, and Wellness tests. 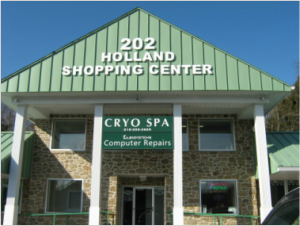 We are located in beautiful in Bucks County in Holland PA, minutes away from Newtown, Richboro, Langhorne, Huntingdon Valley, Yardley, Levittown, Southampton, Feasterville, Warminster; nearby New Hope, Chalfont, Doylestown, and North East Philadelphia. We are always looking for professional, inspired people with passion for Health and Wellness to join our team! Cryo Spa Natural Healing Center is looking for a Shiatsu Practitioner. Cryo Spa is a unique place that has an emphasis on Eastern Methodologies. We are looking for a talented Shiatsu Practitioner to join our team in Southampton PA. This is a part time opportunity that can grow into full time position. This position offers apprenticeship opportunities with Lucy Goldstein, an experienced Shiatsu practitioner and owner of the Cryo Spa, for those who are interested in sharpening their technique and deepening their awareness. Come join our nurturing, supportive environment of soulful bond and personal growth. *Service compensation $35 – $45 per hour depending on experience. Please send us your updated resume and a cover letter to info@BucksCountySpa.com or and/or call 484-213-2938.